AHS is a nationwide household survey, which was started in 2012/13 with the vision of gathering information mainly on household consumption and current labour force annually. The design of the survey questionnaire has followed the concepts and definitions adopted in Nepal Living Standard Survey (NLSS) and Nepal Labour Force Survey (NLFS) especially to capture household consumption aggregates and the current labour force related information respectively. We are pleased to share the report, Second Advance Estimate of 2016 Paddy Production in Nepal using the CCAFS Regional Agricultural Forecasting Toolbox (CRAFT). This is the final advance estimate of the season. This report relies on information provided through different agencies, including the Department of Hydrology and Meteorology (DHM), Nepal Agriculture Research Council (NARC), Department of Agriculture, MoAD, WFP, International Centre for Integrated Mountain Development (ICIMOD), International Water Management Institute (IWMI), and International Research Institute for Climate and Society at Columbia University. All contributors are gratefully acknowledged for their support. 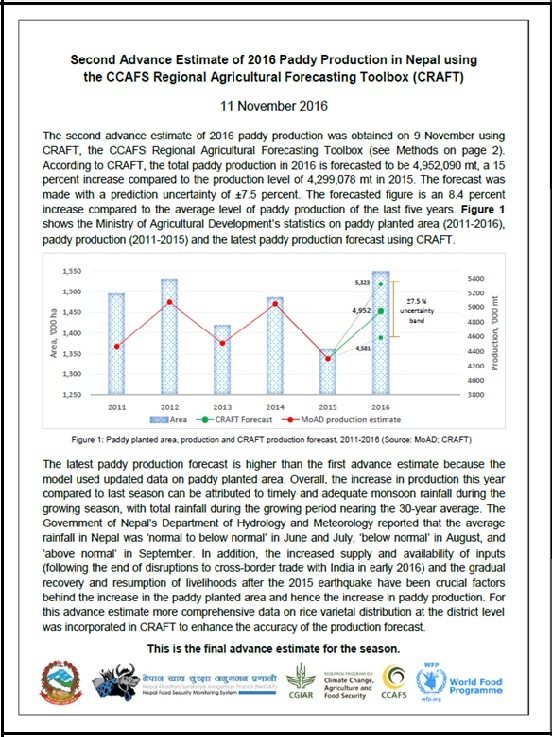 We are pleased to share the report, First Advance Estimate of 2016 Paddy Production in Nepal using the CCAFS Regional Agricultural Forecasting Toolbox (CRAFT). This is a preliminary estimate and it will be revised with updated data as the season progresses. 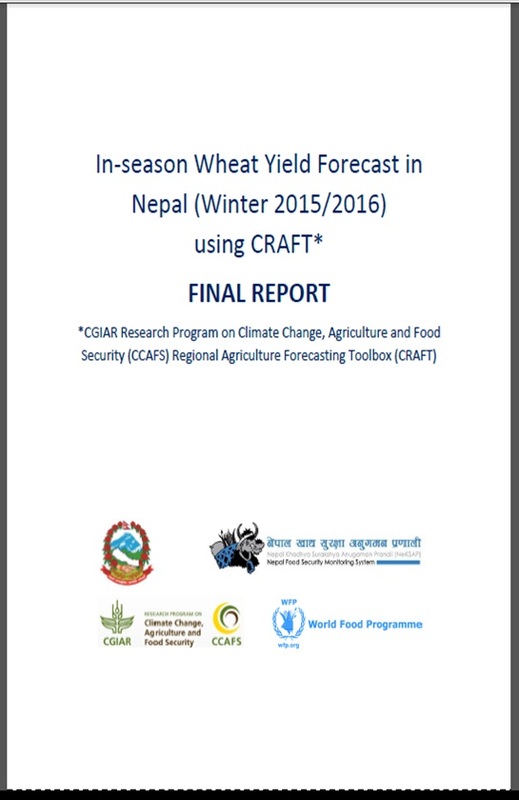 In-season Wheat Yield Forecast in Nepal (Winter 2015/2016) using CRAFT. This is the final CRAFT estimate for wheat production for the 2015/2016 season and follows two advance estimates released earlier in the year. This report relies on information provided through different agencies, including the International Centre for Integrated Mountain Development (ICIMOD), International Water Management Institute (IWMI), International Research Institute for Climate and Society, Columbia University, Nepal Agriculture Research Council (NARC), Department of Agriculture, MoAD and WFP. 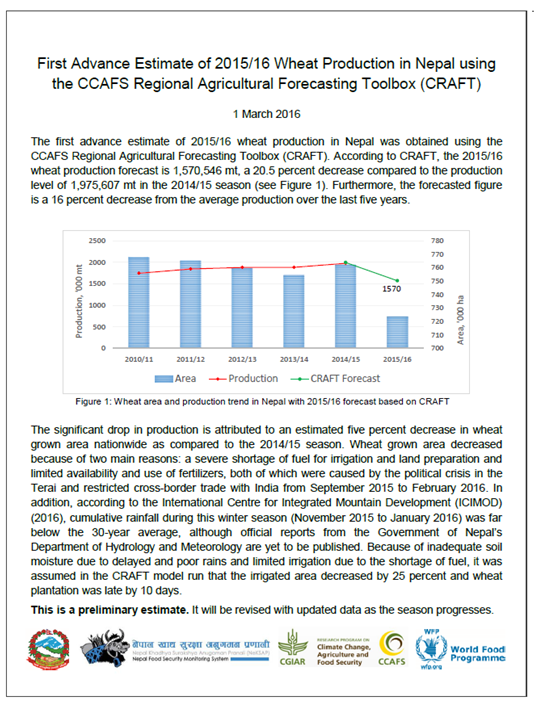 We are pleased to share the report, Second Advance Estimate of 2015/16 Wheat Production in Nepal using the CCAFS Regional Agricultural Forecasting Toolbox (CRAFT). 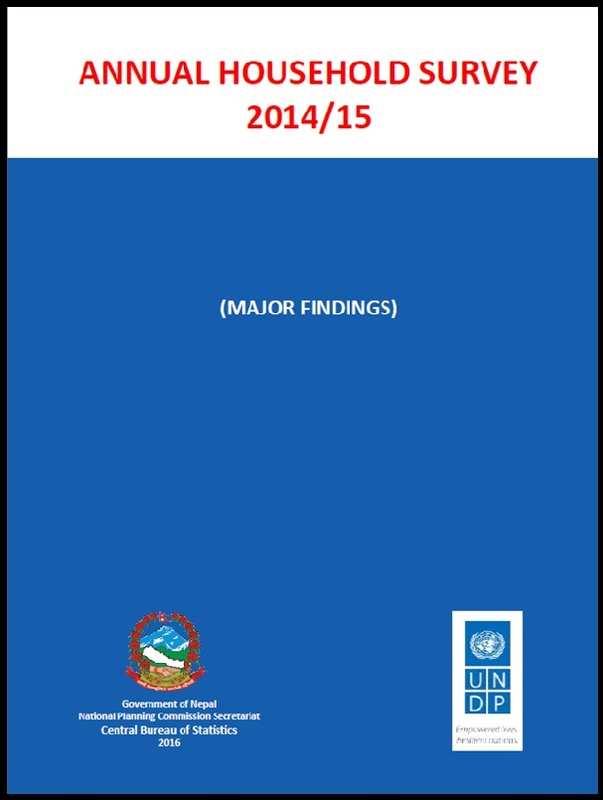 The joint assessment of food security, livelihoods and early recovery is a sample survey of more than 4,000 households in 11 earthquake-affected districts in Nepal conducted in September-October 2015. It is a follow-up to the baseline assessment conducted in May 2015 in the immediate aftermath of the April 25 earthquake. The joint assessment was a collaborative effort by a broad range of partners, including the Government of Nepal’s National Planning Commission and Ministry of Agricultural Development, Nepal Food Security Monitoring System (NeKSAP), OCHA, World Food Programme, Food and Agriculture Organization, United Nations Development Programme, Nepal Red Cross Society, Food Security, Early Recovery and Protection Clusters, inter-cluster Gender Working Group, and REACH. This is a joint product of the Ministry of Agricultural Development (MoAD), World Food Programme (WFP), and the CGIAR Research Program on Climate Change, Agriculture and Food Security (CCAFS). The CCAFS Regional Agriculture Forecasting Toolbox (CRAFT) is being piloted as part of the Nepal Food Security Monitoring System (NeKSAP) and is a new initiative to incorporate crop yield forecasting in Nepal with technical support from CCAFS South Asia. CRAFT was used to estimate paddy production in Nepal over the 2015 season. 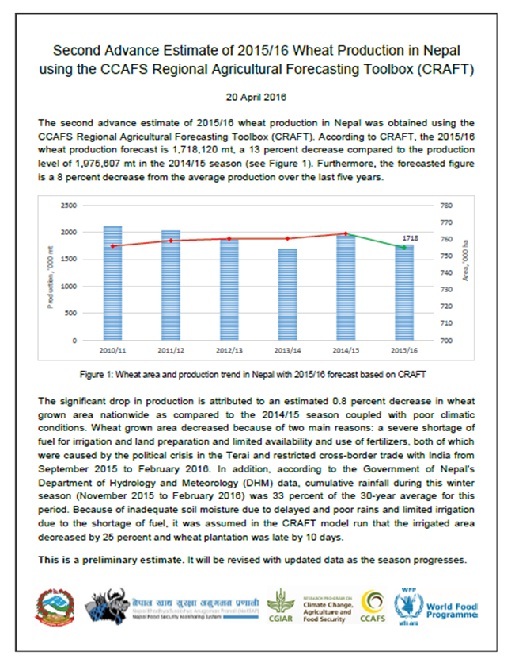 An earlier publication, A Report on CRAFT Implementation for In-season Wheat Yield Forecasting (Winter 2014/15) in Nepal, is also available on the NeKSAP website.